That time of year is here again! The time when most people tend to eat more food, as well as eat more unhealthy foods that are spread out on tables and buffets during social gatherings of friends and family. So what do you do, if you’re like me and struggled to lose 25 pounds since last Thanksgiving? How do you ‘stay on the path’ to eating healthy during this season of indulgence? And how can you offer yummy, flavorful foods at your get-togethers to help your friends and family as well? 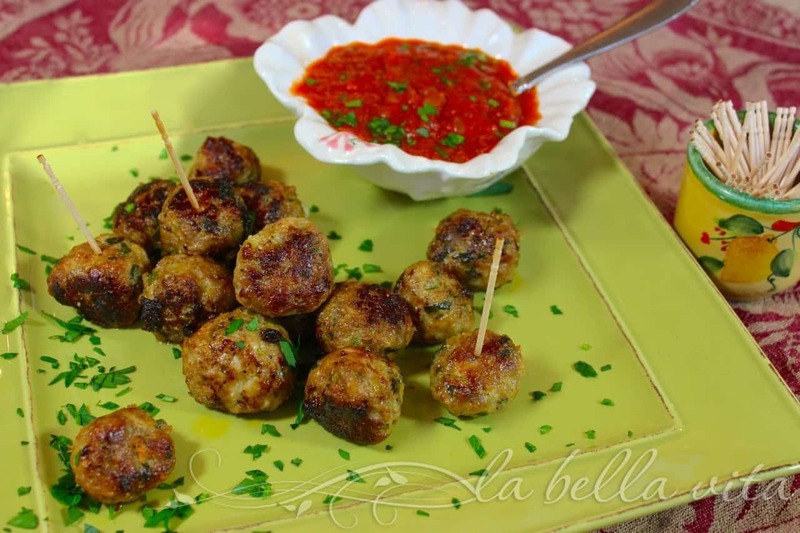 Italian Turkey Meatballs are the perfect answer to this holiday poor-eating versus healthy-eating dilemma! Recently my blog has been discovered Aloha magazine, which has an focus on healthy living. I was asked to create a recipe focused on healthier recipes that are perfect to add to their ‘social-gathering menus’. So I put on my cooking thinking cap and developed this recipe. After adding ‘a little bit of this’ and ‘a lot more of that’ during this recipe’s ‘test drive’, I swear to you that these turkey meatballs are superb in flavor, good for our healthy nutrition, and super easy to prepare. Perfect for any kind of social event. Truthfully, you won’t even be able to tell the difference between the turkey and beef or pork in these meatballs! Plus, meatballs are fun appetizers and can be made ahead and frozen (which is what we’re doing for Thanksgiving). Just re-heat them in an oven or microwave and you’ll be getting your party on in no time. I serve these Italian Turkey Meatballs with my fresh marinara sauce that I prepare every summer from my garden’s fresh-picked tomatoes. I don’t buy bottled marinara sauce because it is full of unhealthy preservatives. You can find my simplest marinara sauce recipe here: Garden Fresh Marinara Sauce. Heat several tablespoons of olive oil in a large, non-stick skillet. Add onions, garlic, and celery to sauté until soft. In a large mixing bowl, gently mix the ground turkey, turkey sausage, sautéed onions, garlic and celery with remaining ingredients. Using a small kitchen weigh scale, form meatballs that weight a half ounce. Pour a few tablespoons more of olive oil into the large skillet and gently hit. Place the meatballs into the skillet and sauté about 15 – 20 minutes until browned on all sides. Place the meatballs in a 375 degree oven to continue cooking for 15 more minutes. How do you try to eat more healthy during the holiday season? I’d love to know! It seems like I always have ground turkey in the freezer. This sounds like a perfect weeknight dinner for our family. I need to use turkey more too, Mindy and this was an attempt at doing so . . . and totally delicious on the flavor scale! My husband is a huge fan of meatballs. This looks droolworthy with that homemade tomato sauce. Meatballs sort of go alongside of easy entertaining, but can be fattening, so we tried this (along with my Italian mother’s help to ‘amp them up’ a bit), and they turned out splendidly! Thank you for the kind reminder Julia! 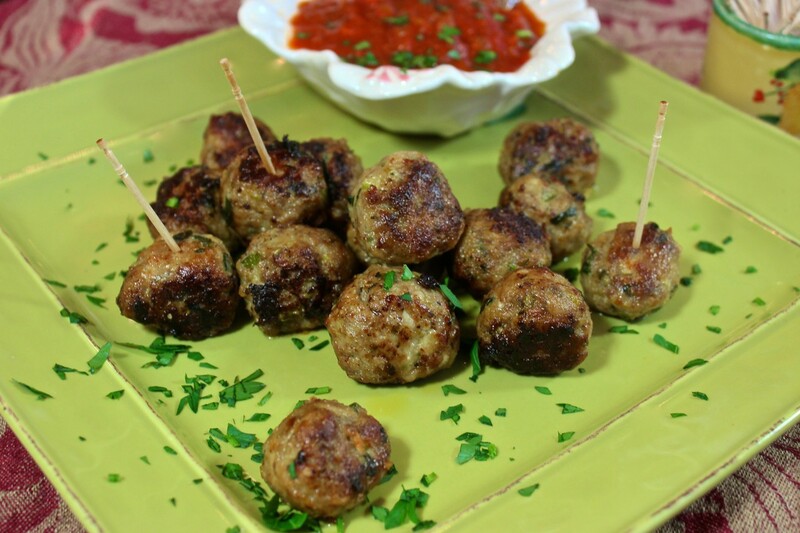 I never had turkey meatballs but these look delicious! Thank you so much and I hope that you can trust me in saying, that with the help of my Italian mother ‘adding this and adding that’ and writing it down, that this is a very flavorful meatball recipe without the beef or pork. Thank you for not only your visit, but for your compliment! They look very tempting and sound really tasty! A fabulous starter. Thank you for your kind compliment and for stopping by at such a busy time! I tend to avoid ground turkey or chicken because it can be pretty bland, but I know it’s healthier than beef. Your recipe looks delicious, Roz, and loaded with flavor. 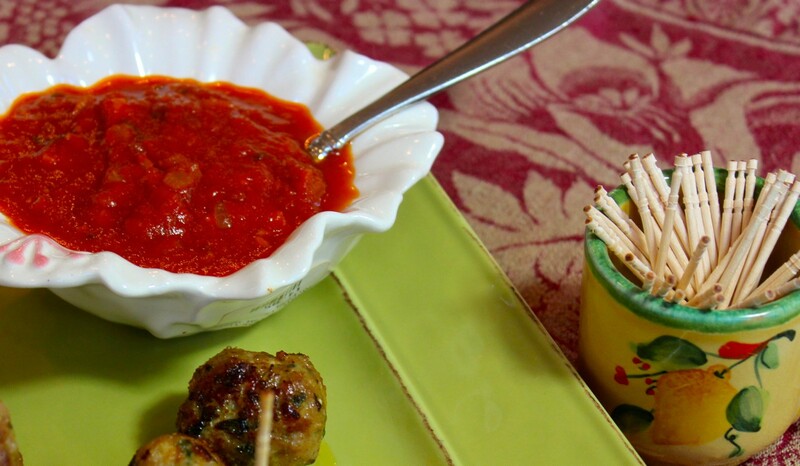 Using marinara for a dipping sauce is a great idea. Thanks for sharing. I totally agree with you Cathy . . . and with my taste-tester mother, she said (upon my first version), these are ‘bland’, as you just stated…..but with a little addition of ‘this and that’, we nailed this bugger! Hope you try it, cuz it sure passed this picky family’s test! We love meatballs at our house, my husband especially. 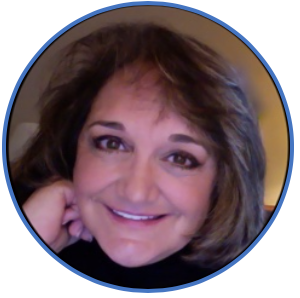 Yours look so good, Roz! With all of the spices in them, they must be wonderful. I have never had turkey meatballs before. That is amazing that you can’t tell them apart from beef meatballs. It must mean they are full of flavor. Thanks for sharing your healthier meatballs! Thanks Katie, Just like regular meatballs only healthier!